Greetings and salutations, everyone; yes, once again it is I, your popular host, Mani the purebred border collie, here to bring you up to date on whatever it is that needs updating. You may remember me from such posts as “The Bulb Frame”, among so many, many others. Here I am in a characteristic pose. I really love the couch. Sometimes the guy I live with sits on the couch with me, in the evening, reading a book. He said that some time he might read me a story, too. He also says it might be time to consider getting new cushions for the couch, which is why there’s that maroon fleece covering the existing cushions, which are pretty worn out now. The original stuffing was kapok. I’d never heard of kapok but we looked it up on the internet. When the guy I live with was little, practically everything was kapok, bamboo, rattan, or ivory. “Ivory?”, you ask. Well, yes. Maybe I never showed a picture of this before. It’s on a little wooden platform on the wall; the guy I live with brought it to the house when he and his wife moved in. It’s very dusty, as you can see. (The guy I live with carefully washes it off about once a year.) These pictures are not hugely in focus. The fisherman has always been called “Leo Key” but that might not be right, since “Leo” doesn’t sound especially Chinese. 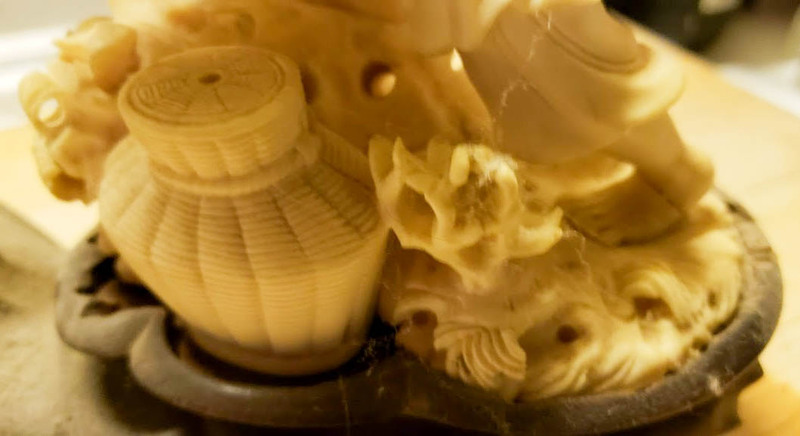 It is ivory, except for the eyes in the dog and snake. Some of the fins on the carp were broken off, but if you look right above the dog and snake you can see that the statue has been broken in half, which the guy I live with said they would say something about if the statue were taken to the “Roadshow”. It was broken in half when it was knocked onto the floor when the guy I live with’s mom was dancing with her then boyfriend in the living room of the house on Oakwood Avenue in Los Angeles, where she and her mom were living while her father was in New Guinea, in 1944. The statue sat on “the Magnavox”, which was a nice cabinet holding a record player and albums of 78s (the guy I live with said he can still remember the pleasant smell of the cabinet when the doors were opened), and the blue lamp you sometimes see in pictures featuring me. A plate of oreos, some celery, and a glass of milk were set out on top of the cabinet on Christmas Eve, for, you know, the visitors. And that’s what the guy I live with thinks of when he looks at the ivory fisherman. Not very much has been happening here. The guy I live with said he was totally sick of turkey and would never have any ever, ever again. (I did get some.) He read that cooked turkey shouldn’t be kept in the refrigerator for more than four days (less it if was thawed in cold water, which it was), and so it was with a considerable amount of relief that he decided to dispose of the rest of the turkey. Of course I would have helped him dispose of it. The guy I live with took some pictures of the garden, with the phone. Just to show how dry it is here. The crocus, Crocus niveus, is still flowering, even though it gets a little below freezing almost every night. This is a special form of it, I guess. There are some others which finished flowering quite some time ago; you can see the leaves off to the left. The cyclamen are doing pretty well. It’s okay if the leaf stems elongate while they’re growing upstairs. 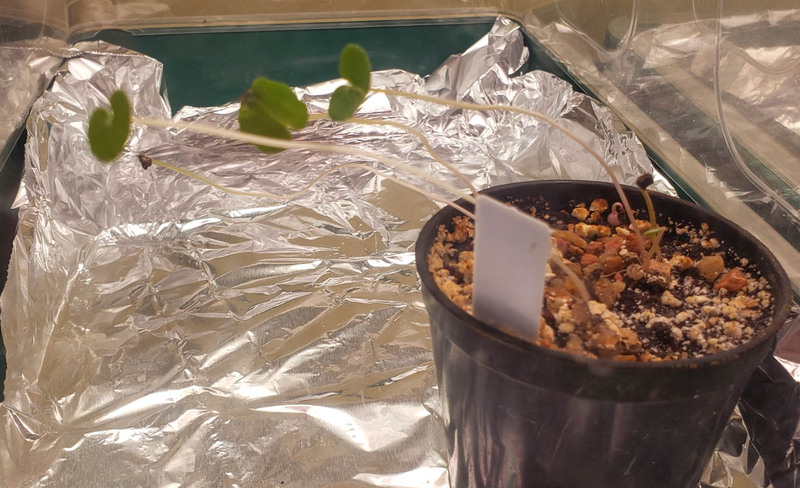 In fact, there’s a cyclamen he grew from seed which is really elongated.This is okay because the cyclamen do go dormant in the summer; when they get planted outside everything will be perfectly normal when the leaves grow again. 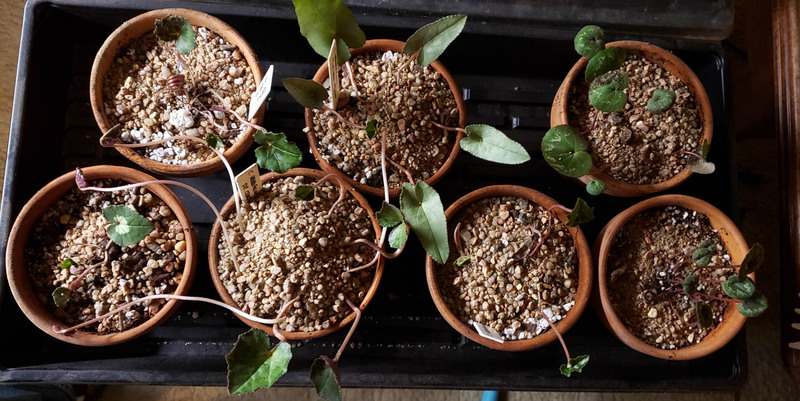 By the way, the seedling cyclamen were grown from pretty old seed, which you can do even though some people say you can’t. The packet of seeds came from the distribution of surplus seeds from the North American Rock Garden Society seed exchange. 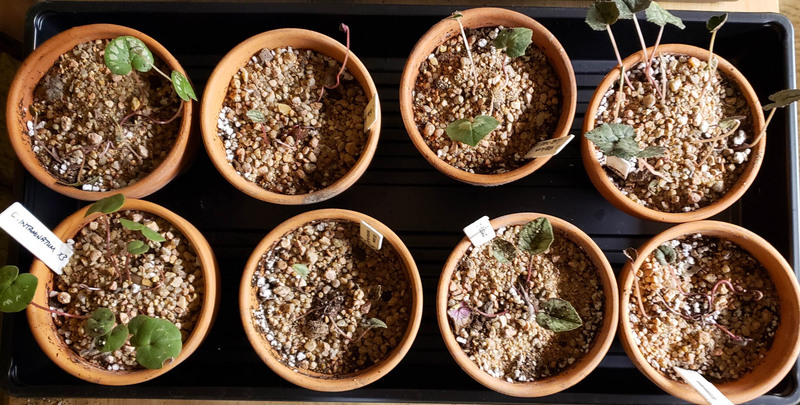 The seeds get the covering of gravel you see there, then the well-watered pot of seeds goes into a baggie which is folded over (not closed), and then into the closet until the seeds start to germinate. This can take several weeks. The seedling cyclamen won’t go into the garden for a few years, at least. My evening walks have been pretty interesting. Sometimes I feel like I’m being watched. The guy I live with says I am. This is a different owl from the one whose picture the guy I live with posted on Facebook. If you didn’t see those pictures, maybe I should post them here. You can see this one has a white collar, or ruff, maybe. We hear them hooting every night now. The guy I live with said that when I was little and slept in my upstairs fort, I got scared when I heard the owls for the first time. So that’s it for today. I’ll leave you with a typical picture of me on my walk, being watched by owls. Wow to the owls! I’ve never seen one in the wild. I’d like to. I have seen wild turkeys, though. Lots of times. I can just imagine the Roadshow talking about that ivory statue. I never thought about it before, but I don’t think I have anything that is Roadshow worthy. Hm. 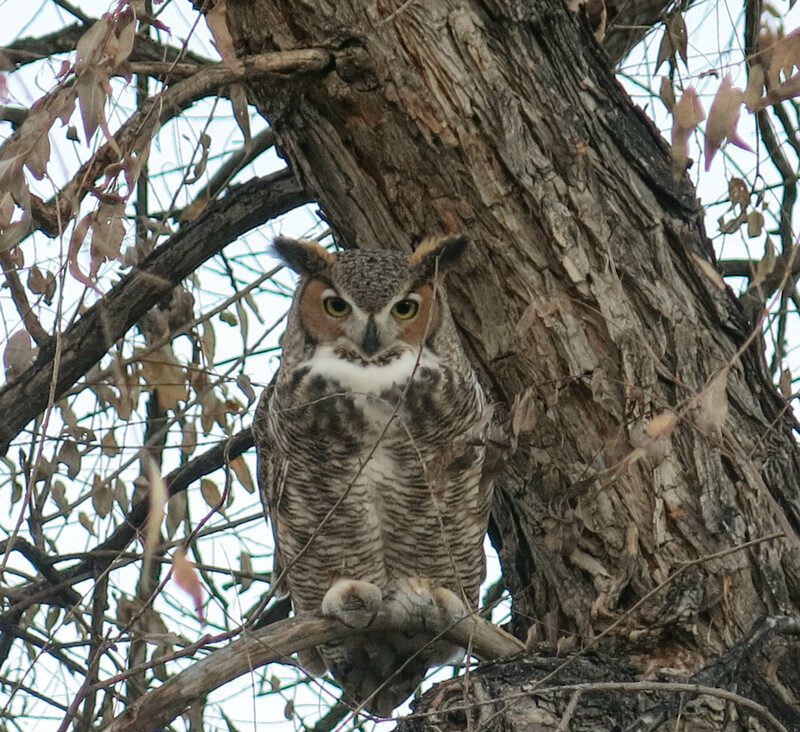 The second owl was hooting when we walked up to it. It was only about twelve feet off the ground, in one of the willows. It kind of leaned forward and went “Hoot hoot”. Then a young woman came by with her two kids, and two dogs that I bark at when they walk by my house and the guy I live with always says I know those dogs. 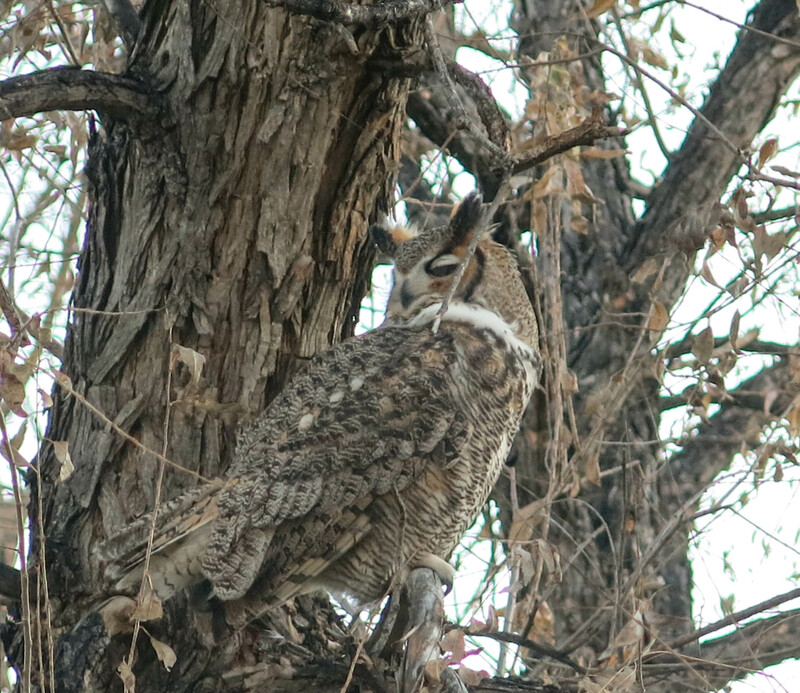 The guy I live with made a kind of Quiet signal and pointed to the owl, so the two kids walked up very quietly, and got to see their very first owl. That was pretty cool. On the day before Thanksgiving, a herd of turkeys came to watch me cut down a Catalina cherry tree. (It is really a Santa Catalina Island cherry. I think it is rude and disrespectful to Santa Catalina to shorten the name.) They were not talking turkeys. They might have been jive turkeys. They just made weird chuckling sounds, as if they found the process of cutting a tree into firewood to be amusing. The guy I live with says we have turkeys here, but more “up in the mountains”. We have plenty of them in Clear Creek County. The probably stay in the mountains for safety. They know they are safe here because they can not be shot at with so many homes nearby in the neighborhood. Not much for them to eat around here. Owls are wonderful creatures to have in our yards. You’re lucky to have different types to see and different calls to hear. I once had a Western Screech Owl family living in a tree in my back yard. It was fascinating to watch the baby owls grow, learn to fly, and eventually leave. I think their parents needed a long vacation when their three owlets were finally independent. They worked hard during the weeks of parenting! Maybe your best friend could read some of your early posts aloud to you when you sit on the couch together. You two could remember the fun and adventures you’ve shared. Maybe share a meal at the same time!! 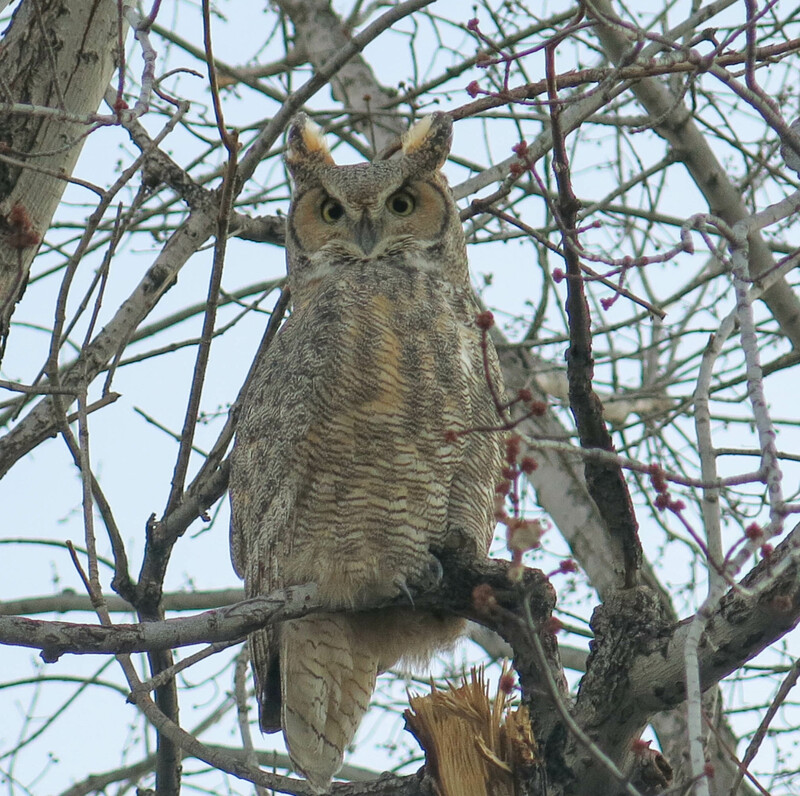 The guy I live with says we have screech owls here, but he’s never seen any in this neighborhood. 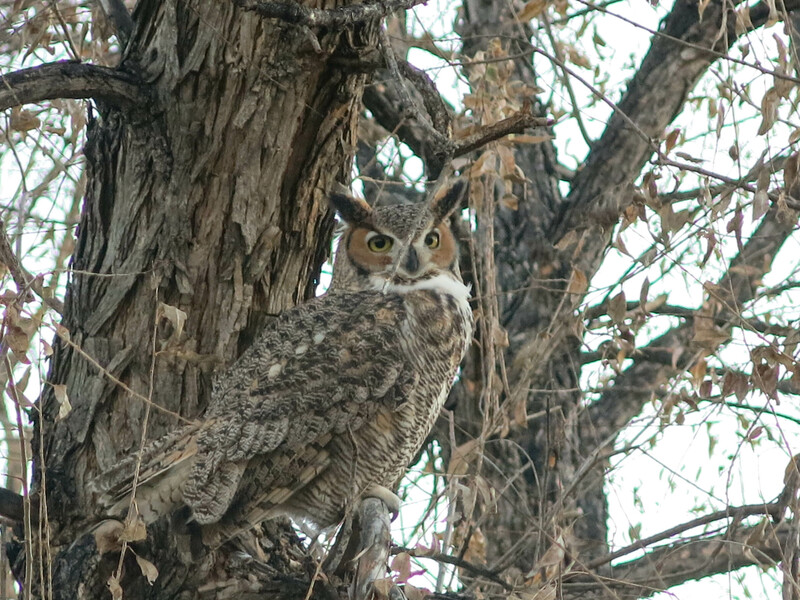 I do hear the Great Horned owls hooting every night now. It might be nice to hear my early posts read out loud, though I imagine there would be a lot of editorializing. It’s been quite a while since I’ve seen the word Magnavox. I suspect young people won’t know it. 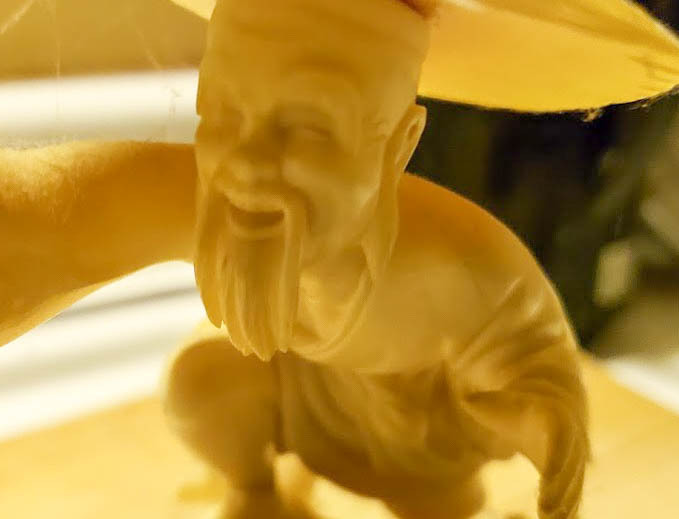 Love your ivory statue especially the little dog. The firm is still around, but the guy I live with says this was a pretty nice cabinet with two doors, a radio inside (tubes of course), and record player, and a speaker. On the left side was storage spaces for records. There used to be records here, but not any more. Lots of old records. You’re always good-looking, but thinking about turkey brings out the most soulful beauty in your eyes. It’s a wonder you didn’t get more of the now-vanished bird. Enjoy the garden, ennobled by owls. I’m betting the squirrels aren’t big fans. Thanks; I try to look as soulful as possible where food is concerned. The guy I live with says that squirrels hide in their nests when the sun goes down, just to be safe; I think we’ve only seen one running around at night, here. Condolences on not having all the turkey you could desire, dear dog. Really, just because the guy you live with has no appetite! You need your nourishment because you’re being Watched. Such fierce owls, such beauty in your trees. Your yard does look dry as a bone-y winter, good thing there’s pots and pots of cyclamen flourishing inhouse. How valiant the little Crocus niveus still flowering outside. 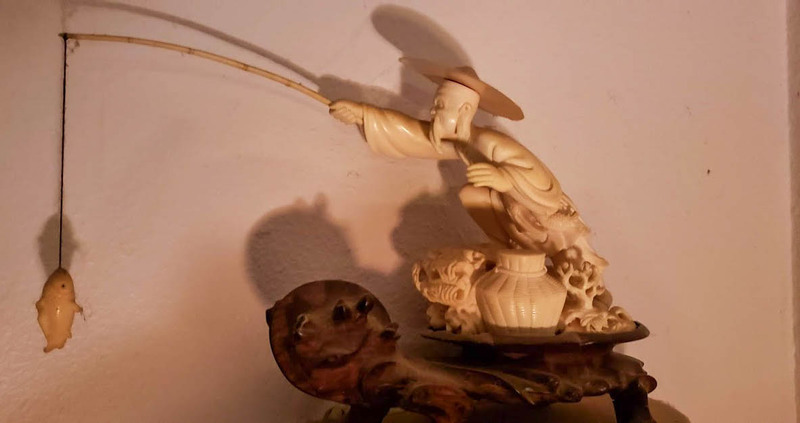 I like the Chinese fishing piece with the happy-looking dog. In January and February, three Roadshows from the Hotel Del will be broadcast. If we possessed anything near as excellent as your ivory, we would have shown up for audition and undoubtedly chosen for camera work. Thanks; the guy I live with said that if the fisherman were brought to the Roadshow the first thing he would hear is “condition issues”. It was indeed broken completely in half, and then glued back together. (I think it’s still the same 1944 glue holding it together.) Broken in half usually reduces the value a little. By more than half, I understand. Turkey is okay but I do like salmon better. I get Taste of the Wild Pacific Stream for breakfast and dinner. The guy I live with says I have “cat breath”. 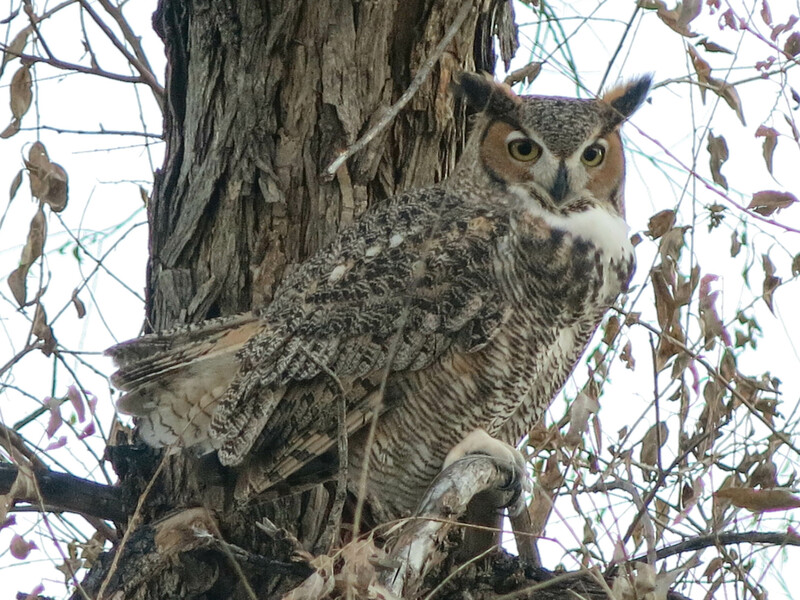 Wonderful to be able to see wild owls in your own garden, and very thoughtful to share them with neighbor children. I’ve only seen a couple of wild owls, and each time was very thrilling so I can imagine their excitement. Your dry garden looks beautiful and elegantly delicate – we have now had more than 60 inches of rain in 2018 so there is no restraint to be had, its all lush and soggy. And cold! We’ve had about sixty inches of rain here, too—in the last fifteen or twenty years. It’s been just below freezing every night here for a while now, but not so cold during the day. And very dry. Hi Mani! Sampson the doberman, here. Those owl pictures are incredible! We had a merlin in the front yard a little while ago, but no one got a photo. We have one of those radio/record player cabinet things with the tubes! The guy I live with listens to it every once in awhile. All I know is that it is a “world band” radio, which means you can fiddle with the dials and listen to Japan, which is so not as interesting as it sounds. We sometimes get merlins and other small hawks flying through the garden, or crashing through the lilac hedge. The guy I live with bought me an internet radio and it gets any station that streams, I guess. He really did buy it for me, so it can be on when I’m here by myself. It’s also on at other times, of course. 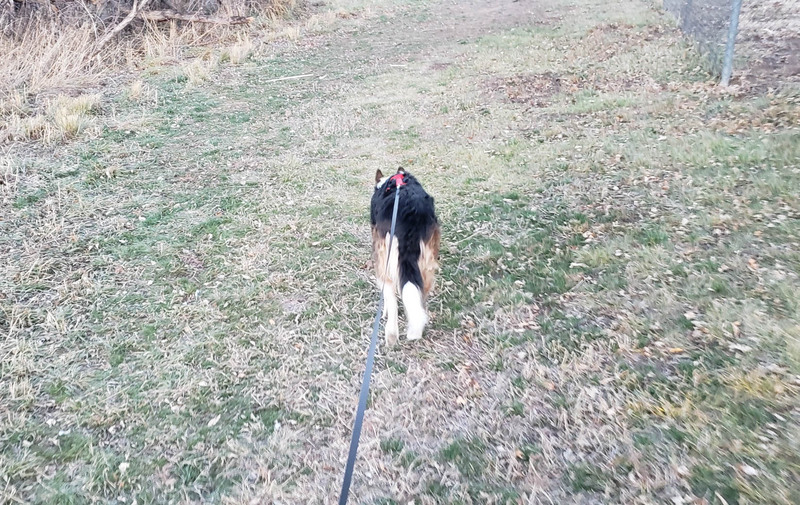 There was always a radio on when the purebred border collies who lived here before me had to stay at home by themselves, and for me, too, but a while ago the old clock radio wouldn’t pick up the usual station, and so the guy I live with decided to get the internet radio. And to throw away the clock radio he’d had for ages.